We take care of all residential and commercial plumbing problems. We are equipped and trained to handle kitchen and bathroom remodels. Call us for all drain cleaning and sewer repairs. We install toilets, Faucets, garbage disposals, dishwashers, water softener's, ice maker lines and sprinkler valves. We work on gas lines and area drain lines. Tankless and regular water heater change outs are considered emergencies and can be taken care of the day you call. Glendora plumbing gives FREE estimates and SENIOR discounts! We service all the surrounding cities within a 20 mile radius. Small travel charges may apply beyond our service area. Where do you need the services rendered? I have been using GP for a long time and they are quick and efficient at clearing out my drains! Great honest shop. I had Mike come over my house to do some work for me for an additional. I thought his prices were very reasonable. He had a great attitude, and explained what needed to be done and why it needed to get done. The work was done quickly and well, and passed the City inspection. The city inspector even made the comment, that the work was done well... And was not surprised when I told him it was From Glendora Plumbing. I have a 100 year old home and a rental property (condo) that Glendora Plumbing services. Mike is not only a great plumber, he has become someone I rely on for referrals and advice. He has come through for me for more than a few emergencies. After ten years of service and installs, I have recommended Mike many, many times. Two years my wife has asked me to get a leaky shower repaired. We don't use it so I kept putting off calling for help,( guys don't ask). I called two plumbing company's with no response. Then I called GP, they came the next afternoon! I also was concerned about the cost of repairs. GP gave me an estimate of one to three hours at $98 per. Ron came and had the problem solved and repaired within an hour! I will continue to call GP from now on. Joe & Mike are here to help! 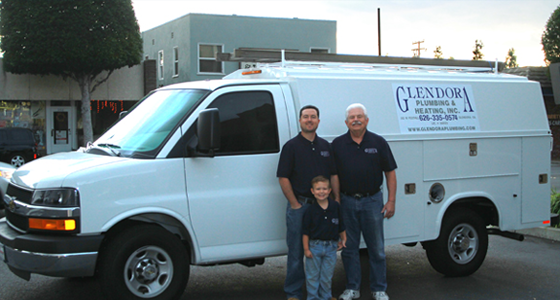 Glendora Plumbing is owned and operated by A Father and Son team Joe and Michael Babineau! Tankless and regular water heater change outs are considered emergencies and can be taken care of the day you call. Install toilets, Faucets, garbage disposals, dishwashers, water softener's, ice maker lines and sprinkler valves. We work on gas lines and area drain lines. Give us a call for any remodel or Home improvement projects, if we can't do the job we know people that can. We have dry wall, electricians, painters, carpenters and even handy men that we trust to refer to you. What Set's Glendora Plumbing Apart? Although GLENDORA PLUMBING & HEATING has lots of competition, there is only ONE Company named GLENDORA PLUMBING & HEATING! Since 1955 GLENDORA PLUMBING & HEATING has been in Glendora. It is now the oldest plumbing shop in the City and one of the last hourly rate shops around. We have succeeded by honesty and putting our Customers first. Note: These are our preferred Products. We will install anything you want or that you buy on your own also.